A early two thousand and five hundred years back in the road of history, the most beautiful and gracious event happened, the emergence of our mighty Lord Buddha. In the same era, there was an unquenched thirst among the public to find the truth of life and in order to find or achieve that, they practiced various methods. However, those people were fortunate enough to be touched by the supreme wisdom of the Gautama Buddha. Lord Buddha went looking for them and showed them the hidden truth of life in a unique way that no one ever had come across. It was the astonishing and ultimate truth that the Buddha discovered. Once they heard the Buddha’s wonderful words, they became the sages of that time bringing the ‘Golden Era’ to India of all times. People successfully got rid of the ongoing misery, anxiety, agony, awkwardness and grief with the great teachings of the Buddha. They were able to face their life challenges without heartaches, and they managed to mark the end to the continuing cycle of Sansara – The birth and death. The Buddha with his ultimate kindness saved the people from pain and suffering. This was the most successful and most beautiful time that had ever occurred. The level of intelligence of people in that era was not the same as present and pretty hard to be compared. They were so advanced in thinking about life and have not fallen or trapped for simple and fake tastes of life easily….. Not like nowadays. Lord Buddha had spoken of different ways to see the path with intelligence by rejecting the myths of life with proper explanations as per the ‘cause & effect theory’. Buddhism is a collection of these noble discourses, the Dhamma, which awakened the wisdom of the people. After the passing way (Parinirvana) of the Gautama Buddha, all his noble disciples (Sangha) who attained the enlightenment safeguarded the Dhamma for the future in ‘Magadhi’ (alias Pali) language, which was used in Buddha’s time in India. 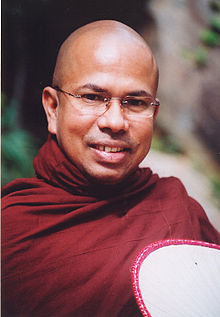 The noble Sanga became ambassadors of the Buddha’s Dhamma and disseminated the word of the Buddha throughout the world. The sublime mission was implemented by the great king Dharmashoka. As a result, his son Arahant Mihindu Thero arrived in our little Island with the intact words of Lord Buddha. Most respected Arahant Mihindu Thero delivered the original sermons of Lord Buddha to our fortunate ancestors. The Arahant Mihindu Thero also introduced our ancestors the Bhikku-hood (becoming a Buddhist monk) to help them follow a sacred life higher than the secular life patterns they knew. Lay disciples also successfully learnt as how to practice this Dhamma in their day-to-day lives. The noble mission of Arahant Mihindu Thero established the Buddhism in Sri Lanka and safeguarded its’ existence for many future generations. As the time passes, anonymous changes did hit the economical, social, political, educational and religious sectors in each and every part of the world. As a result, the novel Buddhism and the practicality among followers had disappeared. But fortunately the most precious teachings of the Buddha that was rendered to us by Arahant Mihindu Thero had been safely protected. Though the practicality in Buddhism among the people started fading away, people always continued to search for something better and realistic for themselves. At present, the public is not so keen or interested in searching for truth comparing to the Buddha’s era, but there are wise groups who interested in investigating the hidden side of life. I tried so hard to learn the Dhamma facing many challenges on my way in uncovering this ultimate truth. I was so fortunate to read the noble Dhamma of the Buddha in full – The dignified inheritance of Arahant Mihindu Thero. Buddhism is the most wondrous wisdom in the world. These teachings show us the enormous talent, kindness, self consciousness, pure mind, intelligence and the unmatched identity of the greatest person appeared ever on this earth – The Buddha. All these points together reflect one thing….. The uniqueness of the Thathagatha (one of many names that used to address the Supreme Buddha). I welcome you all to Mahamewna with Mettha. Within our Dhamma service we have no restrictions with regard to the race, cast, language, colour or religion. The truth unveiled by the Gautama Buddha is open to everyone. If you are wise to understand that truth, then that truth is for you and for your own good and protection. Therefore, let us gather around that truth, the righteous Dhamma. Let us learn it, understand it and live accordingly. Let us share this splendid gift of Dhamma with everybody. That is our noble duty of the time. May you all be blessed by the Buddha, the noble Dhamma and Sangha, good noble friends in Dhamma and all deities!